Rory McIlroy fired a seven-under-par 65 to move into second place, two shots behind leader Peter Hanson, after round two of the BMW Masters in Shanghai. The world number one boosted his hopes of topping the money lists on both the European and US PGA Tours with a bogey-free round featuring seven birdies. The Northern Irishman is on 12 under, with Ryder Cup team-mate Hanson out front on 14 under after posting a 64. Fellow Swede Robert Karlsson also shot 64 but Jamie Donaldson crashed to a 74. The Welshman, who led by four after an opening 62, now trails Hanson by six shots. Justin Rose, who could overtake McIlroy at the top of the European Tour money list with victory in Shanghai, posted a second successive 68 to lie four behind McIlroy and six off the lead. 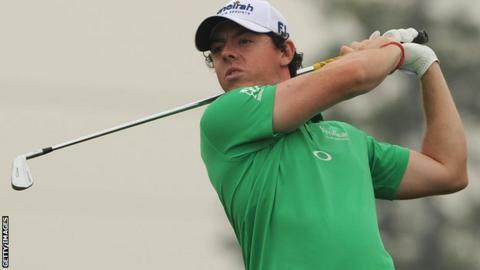 He is in a group including Ireland's Shane Lowry, winner of the Portugal Masters two weeks ago, who went round in 64. Hanson, the only member of Jose Maria Olazabal's side not to have something to show for his efforts in Chicago last month, actually started with a bogey but then birdied the long third, added four in succession from the fifth and then three more in a row from the 11th. The five-time European Tour winner added another at the 612-yard 15th, but now faces a head-to-head battle with McIlory, who won the Shanghai Masters on the same Lake Malaren course 12 months ago and is seeking his fifth victory of the season. "It's going to be fun," said Hanson. "He's going to be tough to beat and I'll play 30 to 40 yards behind him, but hopefully I can give him a game. "It's always nice to follow up a good 66 with an even better round. The greens are beautiful and the course is still pretty soft." McIlroy's compatriot Michael Hoey, whose 70 included four birdies and two bogeys, is tied for eighth place on seven under in a group including world number three Luke Donald (67) and two other European Ryder Cup players, Nicolas Colsaerts (68) and Martin Kaymer (69). Graeme McDowell dropped back to joint 28th on four under, 10 shots adrift, following a 71 while Ryder Cup captaincy contenders Darren Clarke and Paul McGinley were both well down the field on five over.